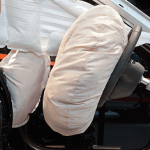 ARCCA Experts and Engineers Blog | Have an airbag failure claim? HAVE AN AIRBAG FAILURE CLAIM? If so, you won’t want to miss the article by Alan Cantor and Lou D’Aulerio of ARCCA which appears in the June 2017 issue of CLM Magazine concerning the Takata airbag recall. In this article, they discuss the issues involved with the recall and the implications, from an insurance perspective, when evaluating individual incidents. To read this important article, click here. ALAN CANTOR, BSAE, is the CEO of ARCCA and is a premier expert in vehicular crashes, as well as the research, testing and development of occupant seating systems, restraint systems, and crash protection devices. He has been called upon by the US Congress and other organizations to offer opinions regarding occupant protection and has been involved in numerous design and study efforts on these issues for NHTSA, the US Navy, US Army and NASA. LOUIS D’AULERIO, BAP, is also a premier expert in occupant crash protection in both air and ground vehicles. He specializes in seat belts, airbags and seating systems for adults and children. Prior to joining ARCCA, Lou was a lead engineer for the US Navy’s development of their Naval Aircrew Common Ejection Seat which is still used today in combat aircraft.